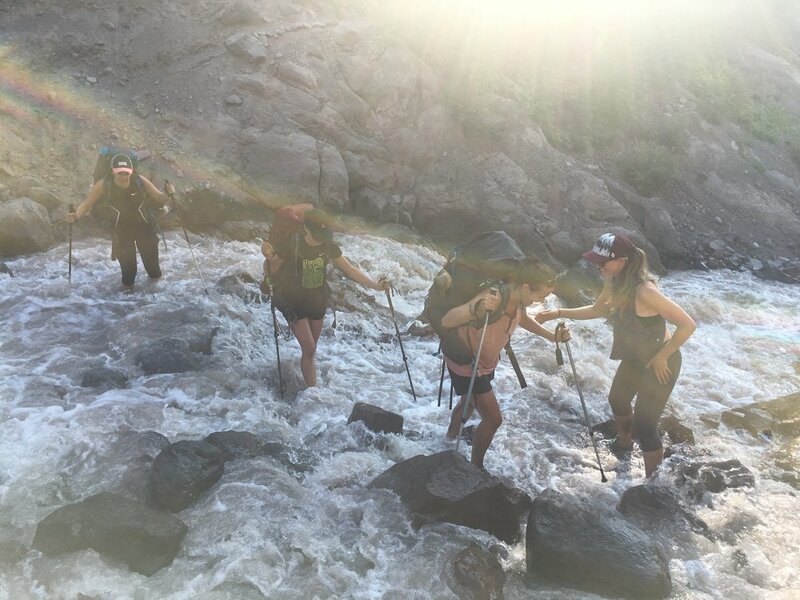 Your adventure awaits...a fun, challenging, and rewarding weekend in the wilderness with two expert guides, lots of delicious things to eat, pristine lakes to swim in, alpine ridges to traverse, powerful muscles to stretch, and epic views to soak in. Escape the stress and pressure of everyday life. Explore one of the most beautiful sections of the world-famous Pacific Crest Trail. Enjoy wholesome, artisan food—recipes designed to energize your body and excite your tastebuds. Expand your awareness of your own strength, adaptability, and flexibility. 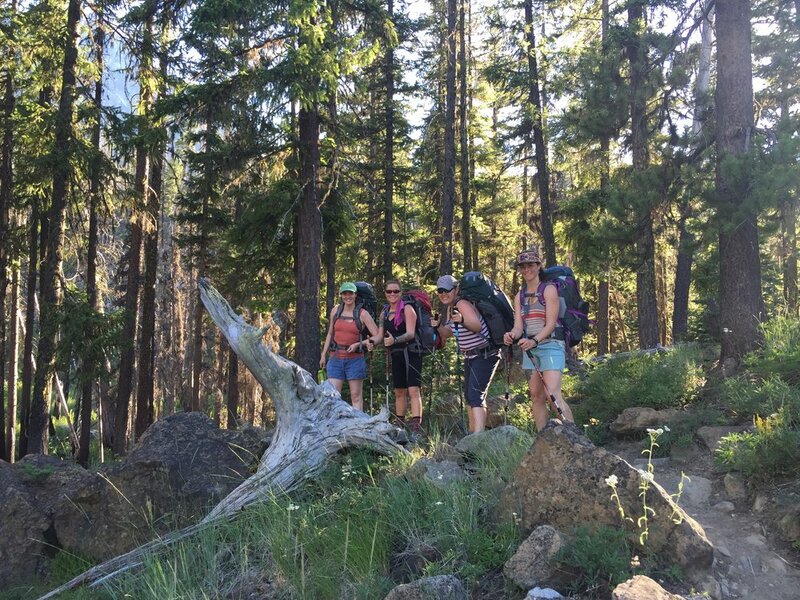 Whether you've never been backpacking before or consider yourself a wilderness expert, this retreat offers the perfect opportunity to connect with nature, yourself, and some fun, free-spirited females. To promote a true wilderness experience, each retreat has space for only 8 adventurers. Sign up with your email address to be the first to hear details about upcoming retreats! Caroline went on her first backpacking trip in 2013, and loved it so much she decided to hike 2,000 miles on the Pacific Crest Trail the following summer. After more than a decade of an intensely stressful urban life, she discovered how much she loved spending time in wild places, and backpacking totally changed her life. Eat Hike Love was born of Caroline's desire to share the laughter, excitement, adventure, and deep, soul-reviving rewards of time spent in the wilderness with as many others as possible. She lives in the Columbia River Gorge between Mount Hood and Mount Adams, and has extensively explored the wilderness areas of Washington, Oregon, and California. Currently under contract with Moon Travel Guides, she is researching and writing Drive & Hike: Pacific Crest Trail, the ultimate guide to the best day hikes, scenic drives, restaurants, breweries, hotels, campgrounds, and things to do along the PCT (publish date 2020). Caroline has a master's degree in nutrition from National University of Natural Medicine, and a passion for cooking & preparing foods that satisfy on every level: physical, emotional, social, and spiritual. She personally prepares every meal and snack for each Eat Hike Love Women’s Wilderness Retreat. She is also a yoga teacher with a 200-hour certification from YoYoYogi. Becky has been backpacking since 2011. She grew up in the woods: hiking, exploring, fishing, camping, and taking in nature. Her love of the forest runs deep from her early youth and has only grown stronger as she's gotten older, and her explorations have continued to foster her adventurous spirit! She loves foraging for mushrooms, swimming in alpine lakes, and has been known to take a polar plunge whenever possible. 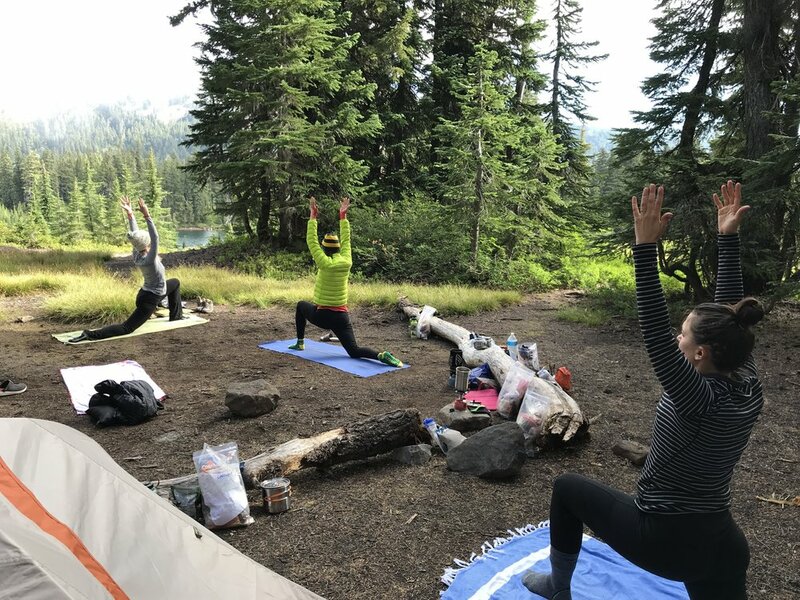 Becky is all about being amongst her favorite people in the woods—and getting to know fellow nature lovers—amidst the beautiful trees and remote wilderness of the Northwest. Becky and Caroline have been friends since 2006 and have been backpacking together every summer since 2015. As the Eat Hike Love assistant guide, Becky brings her wilderness expertise, culinary knowledge, and passion for outdoor adventuring.